Southern Hemisphere with Feng Shui and Vastu. Vaastu. Turning things around! Many things are affected by living in the Southern Hemisphere. Autumn is March, April, May and Spring is September, October, November. Of course, for those who live on the equator, all this is irrevelant, as both North and South lead to colder climates and the water doesn't mess about; it just goes straight down that drainhole. Forget four seasons and drawn out periods of dusk and dawn, these concepts don't exist in equatorial nature. Many forms of divination are affected by this. Even though the majority of people import Northern Hemisphere divination systems without change, there are others who have found good results after adapting their particular system to Southern Hemisphere use. reverse the signs: Pisces becomes Virgo, Taurus becomes Scorpio. 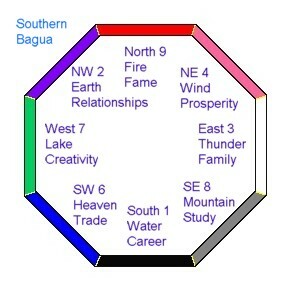 Feng Shui is also adjusted for Southern Hemisphere directions and vortices. For example, the ba gua is usually read in a clockwise direction (see below). However, in the Southern Hemisphere it is read naturally in an anti-clockwise direction. Authors Sherrill and Chu first proposed the concept of changing the principles of Feng Shui for use in the Southern Hemisphere in the seventies. Since then authors Roger Green and Hermann von Essen have further elaborated on the reasons why and how to adapt to Southern hemisphere living according to the principles of Feng Shui. The Nine Star Ki year starts on the 6th or 7th August. The cycle of 60 Heavenly Stems and Earthly Branches differs (see table). The animals proceed anti-clockwise over the Chinese compass. Feng Shui attributes associated with climatic north and south directions swap positions. Feng Shui attributes associated with natural vortices reverse rotational direction. Feng Shui attributes associated with east and west directions remian the same. Feng Shui attributes associated with planetary and cosmic influences remain the same. For example, instead of dwellings being positioned so that they are open to the cold winds from the south and closed to the warmth of the sun in the north, as according to traditional Feng Shui, the red phoenix (yang/fire) is positioned in the hot north and black tortoise (yin/water) in the cold south. Vaastu Shastra is a complicated issue. For example, staircases should wind up in a clockwise direction presumably because this is a natural vortex in the northern hemisphere, however in the southern hemisphere this is unnatural. I have also read that because the vastu concepts are based on cosmological diagrams rather than terrestrial ones, they are usually left unchanged by the change in hemispheres. However, if vastu associates heat with south then this is logically wrong in Australia. ie. Agneya corner is southeast for heat but in Australia this is usually a cold damp position. As the popularity of vastu shastra spreads into countries of the southern hemisphere, more studies by vastu professionals should definitively clear up these issues. Some Wiccans also change the directions and vortices as well. The direction for creating becomes anti-clockwise (widdershin) and the direction for banishing becomes clockwise (deosil). North is Fire and South is Earth.